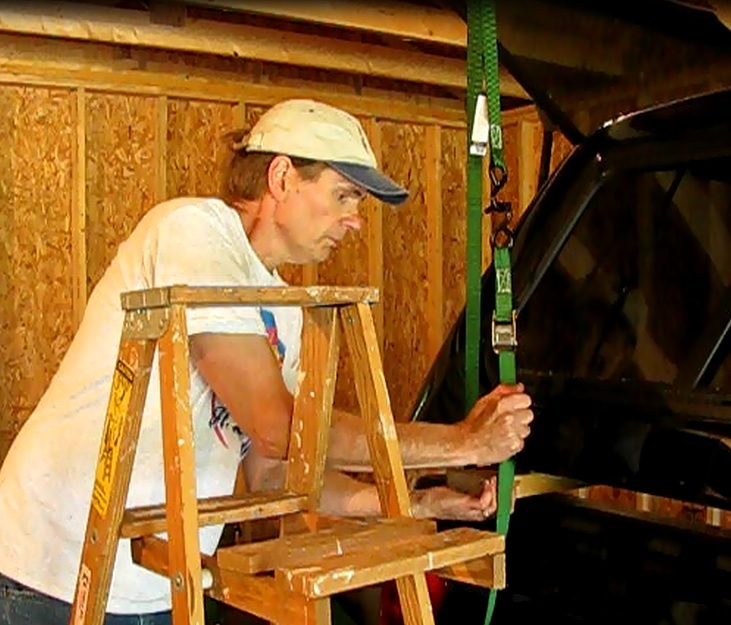 This post covers a building a one person removal rig for a truck cap or topper, with an uneven bottom and asymmetrical shape. Such was the job in lifting the cap from a 2004 Nissan Titan pickup truck. 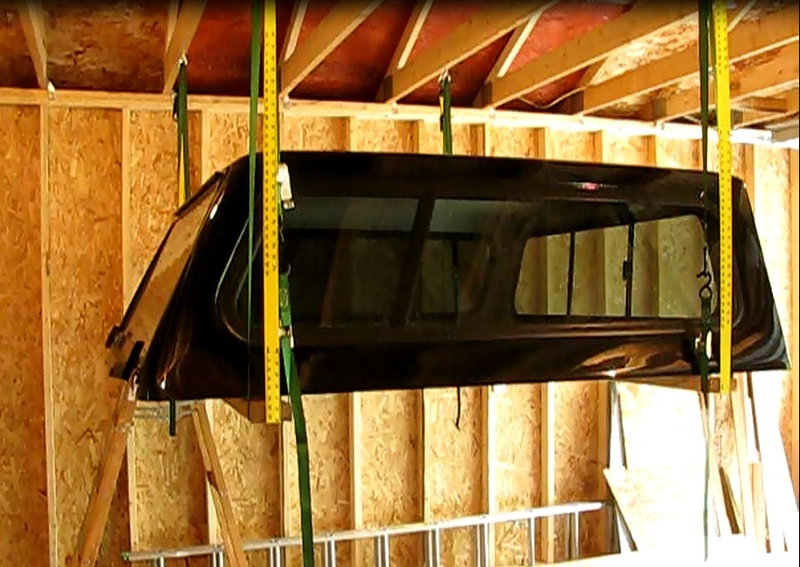 This post discusses methods of getting support boards under this type of cap and lifting and hanging from ceiling joists in a garage. Two 2 by 4s, 79” long (will vary depending on application). Four small wood blocks cut from a two by four, four inches long. Four cam buckle straps, 900lb capacity and 10 feet long (name brand "Smart Straps," $9.98 total at the regional Midwest big box home improvement store Menard’s) See link below this post to the same straps on Amazon. Two ratcheting straps 600lb capacity and 16 feet long (name brand "Keeper," $6.99 ea for a total of $13.98). I posted a link to a four pack from Amazon at the end of this post. 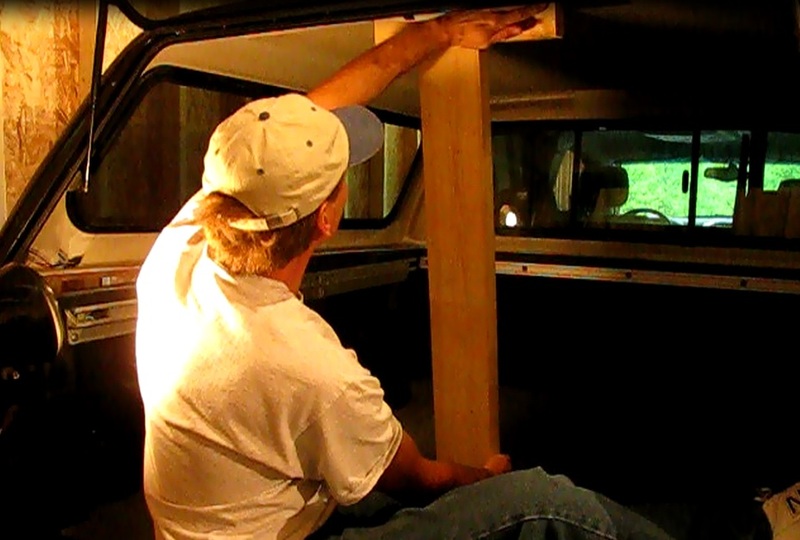 Optional helper fixture for one person to raise of the end of the cap:One two by four two inches longer than the distance from the truck bed to the underside of the rear end of the topper. 1) Back the truck, with topper aboard, into the desired position where the cap will be removed. It needs to be centered beneath two ceiling joists. 2) Remove the clamps holding the cap to the truck and disconnect any wiring to the cap. 3) While raising the cap with your arm, or better yet a T-shaped helper fixture, slip one of the long two by fours under both sides. The helper brace will provide mechanical advantage for lifting the back of the cap. If making a helper, measure the distance from the truck bed to the underside of the topper back end and add two inches. Then simply screw in an eight inch cross member to the top. 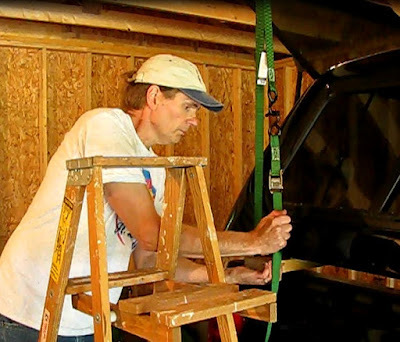 While sitting on the tailgate and with the top (tee) end near the end of the top of the cap and the lower end toward the front, slide the helper brace into the vertical position thereby lifting the end of the cap. 4) Center the two by four. There should be about three inches of overhang on each side of the cap. 5) Lift each corner of the topper and slip in a 4 inch long piece of two by four under the wide part of the base. Position it so there is about an inch between the outside edge of the block and the overhanging ridge on the topper. This will provide some wiggle room when moving the front board forward. 6) Mark the position of each block on the long board with a marker. 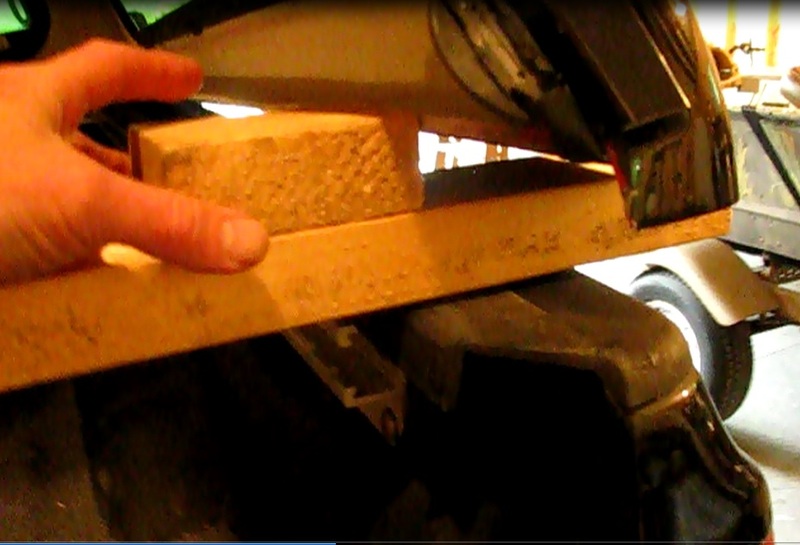 Remove the board now and attach the blocks with a couple of 2 ½” screws. Repeat the process on the other board and make it identical. 7) Place both boards under the end of the topper. This will be easier if you have a helper piece still in place. 8) Remove the helper support if still in place. 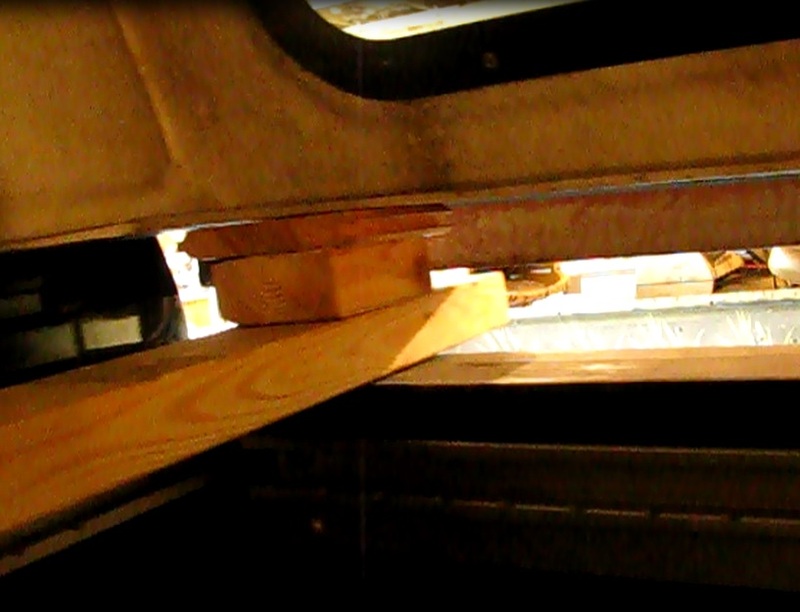 Slide the inner board forward to its final position under the rafter. This may require going back and forth from side to side and moving it a foot or two at a time. Check the block to see if it is still supporting the broad part of the under base of the cap. This one was not. If necessary add an additional board to the block to make sure the outside edge of the topper isn’t supporting it. This would not be good enough to support the weight of the topper. I had to add an extra ½” block to the original one. 9) Check that the two support boards are evenly spaced from the front and rear of the cap. This would be a good time to move the truck forward or back to see that the boards are centered. A plumb bob is useful here to make sure the boards are spaced properly and right under the ceiling joists. 10) With a plumb bob mark the rafter in eight spots. The inside spot will be where the plumb bob just brushes on the cap. The outside mark is where the plumb bob is brushing the outside edge of the support board. Drill a 5/16” hole in each of the eight marked places. 11) Turn in the lag screw eyelet into each drilled hole. 12) One by one hang the cam buckle straps. Feed the free end through the inner lag scew. Assemble the buckle so that when the end strap pulls down it will lift and then lock in place. Place the loop of the strap under the board and just touching the edge of the topper. Raise the cap 2 or three inches. Repeat on the other three corners. Lift at the same time as pulling down on the cam buckle strap. Voila, the cap goes up! 13) With the cap suspended evenly, hang a ratcheting strap from opposite sides and center it on the support board as you ratchet it up. Ratchet just until it is taught. All straps should be evenly tight. Repeat with the other strap. 14) Drive the truck out and check for level. 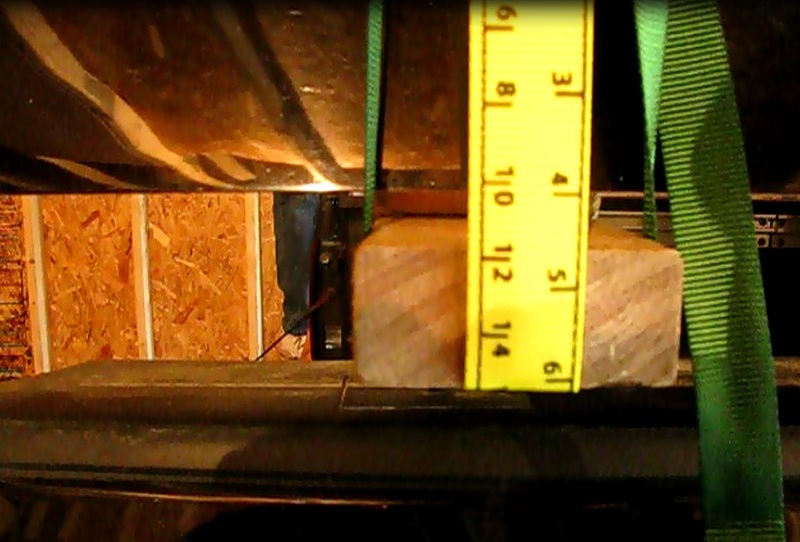 Set the desired height for the topper by pulling up a bit on each cam buckle strap in turn. Finish by snugging up the ratcheting straps. These straps will work fine. The ratchet straps only come in a four pack though. Nice info. Hey, A few days ago I had bought a car and need to buy some car repair tools like multi tools kit and cordless ratchet. What kind of tools need for car owner? A basic set of sockets and wrenches is essential. Channel lock and vice grip pliers are handy for general purpose work. Specialty tools are often needed for brake and other jobs. you will be ready to notice the correct tools once you would like them. Below area unit ways that during which you'll organize your garage instrumentation. The first factor you would like|you would like|you wish to try to to is to lose those stuff you do not use or need Multimeter symbols. I recently bought a Bosch Cordless Drill. Knowing nothing about drills, cordless or otherwise, I thought I'd made a good choice. That is, until I spoke with my neighbor. Beautiful information, I want to buy a cordless ratchet but I don't know what kind of best cordless ratchet for me? Do you mean a cordless drill? If so I would just get a basic name brand 3/8" drill.